Dermalift facials are useful as a preventative treatment for those in their early 30's (or younger for people with premature ageing) and as a rejuvenating treatment for those in their 40's upwards. Dermalift Trial: Cleanse, Tone, application of speciliased Gel and 15 mins trial on your chosen area(s) of the face. Note the forehead or lip takes 5 mins, nose to lip lines 5 mins, both eyes 15 mins, cheeks 10 mins. If you would like to book just one treatment, please click here. 30 mins: Cleanse, Tone, Application of Gel and 20 mins on your chosen area and moisturise. 45 mins: Cleanse, Tone, Exfoliate, Application of Gel and 30 mins on your chosen areas and moisturise. Please note: The neck area is only treated after Session 5 so that the muscles of the face are toned enough to prevent the neck from having a dragging effect on the face. 10% discount for a course of 3 treatments, 11.25% discount for a course of 6 treatments and 12.5% discount for a course of 9 treatments. All products used are cruelty free and except for the Collagen products, the rest are suitable for vegans. It does depend on the condition of your skin and how well it responds to Microcurrent facials but normally a series of six to twelve treatments are needed for the optimum results to be achieved. 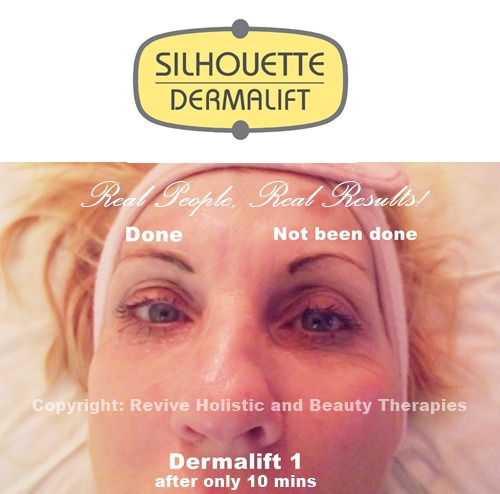 To achieve a full "facelift" look most clients over 40 need a minimum of 10 treatments. Clients with greater aging effects such as severe neck sagging, deep creases, or distinguished “crow’s feet” at the brow, may need up to 15 sessions. Clients need a minimum of 2 sessions for at least their first two weeks, then one per week thereafter until treatment is complete. Those who are on a short timeline (preparing for a wedding, graduation etc) may be treated twice per week until their series is complete. Your cosmetic investment is preserved as long as you are receiving maintenance treatments every 4-8 weeks after the initial treatment span. If you stop maintenance treatments, you risk losing the muscle memory after anywhere from 3-6 months and will have to re-do the series of treatments again to regain the original results.